The Centaur standing frame is easily exchanged with the seat on a Dragon or SnapDragon to allow you to switch between the two positions without compromising posture in either. 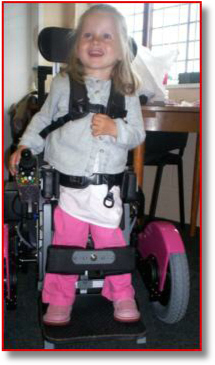 Many people who benefit therapeutically from standing find that it limits their independence and activity because a frame that can give them the support they need is static or only manually propelled. Children become bored and frustrated and view standing as an unpleasant chore they must endure. It can be a constant battle to keep a child occupied and content while they stand and the time they will tolerate it is often shorter than ideal. By making use of the same powerbase as your seat, you can keep the same range and ease of movement you have come to expect when sitting while you are standing. Instead of coaxing a child "stay there just five more minutes and then you can come out of your stander and play", parents report to us that they have a much more satisfying problem: they must cut short the time that the child wants to stand to avoid over-strain and they find themselves bargaining "just five more minutes, finish what you are doing and then you must come out of your stander".